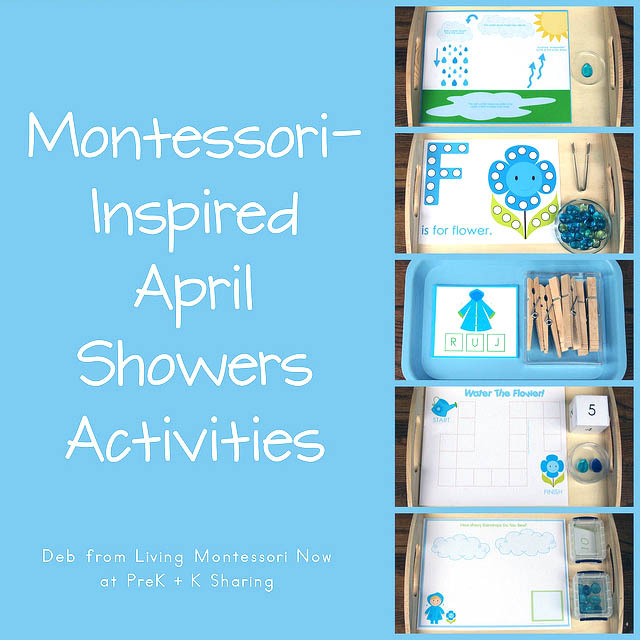 Today, I want to share some ideas for Montessori-inspired trays using a free April Showers Preschool Pack from Our Little Monkeys. I love the versatility of this printable pack! The activities could work well for a spring-, weather-, April showers-, or gardening unit. Thank you, Our Little Monkeys! With 35 pages, there are many hands-on activity trays you can put together from this preschool pack. Print out and laminate the activities you choose on cardstock, or print them out on thick, glossy photo paper and skip lamination for activities that will have very light use in a homeschool. 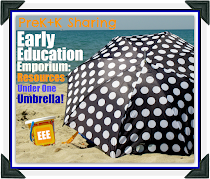 Following are just a few examples of hands-on activities created with the April Showers Preschool Pack. I like to add 3-dimensional objects to an activity for preschoolers whenever I can. For this activity, I found some acrylic gems in a variety of shapes, including raindrop shapes, at a hobby store (Michaels). I used an inexpensive wooden tray from the hobby store. 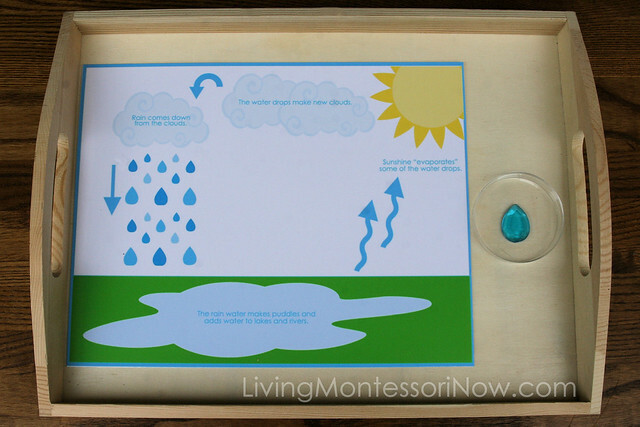 I would use this activity to tell the story of the water cycle, moving the raindrop through the water cycle as I tell it. Then I’d leave the activity on the shelf for the child or children to use whenever they choose. I love glass gems! 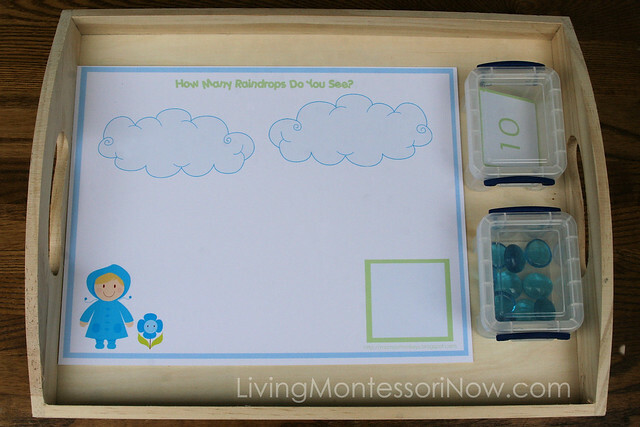 For this Montessori-inspired activity tray, I found glass gems at the hobby store. I put the exact number of glass gems for each color in a round candle coaster along with a sugar tong from Montessori Services. This makes a nice language activity, but I especially love that the themed printable adds interest to a practical life tonging activity. Of course, you don’t need to use glass gems for this activity. You could use playdough balls, pom poms with a strawberry huller, magnetized pom poms or Power Magnets on a metal tray, or dot markers (if you don’t laminate the activity). In Montessori education, we emphasize phonetic sounds rather than letter names. 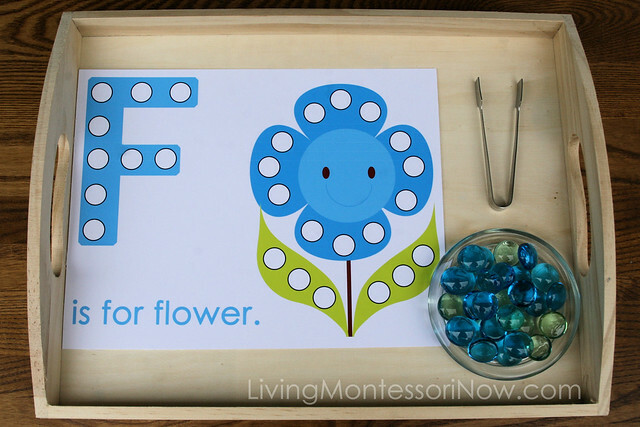 I would demonstrate the activity by placing the printable on a rug and saying, "/f/ is for flower." Then I would show how to use the sugar tong to place a few of the glass gems before returning the tray to the shelf for the child(ren) to use. In the preschool pack, this is intended as a worksheet with a circle-the-beginning-letter activity. I like to cut apart these sorts of printables and make them into hands-on activities. 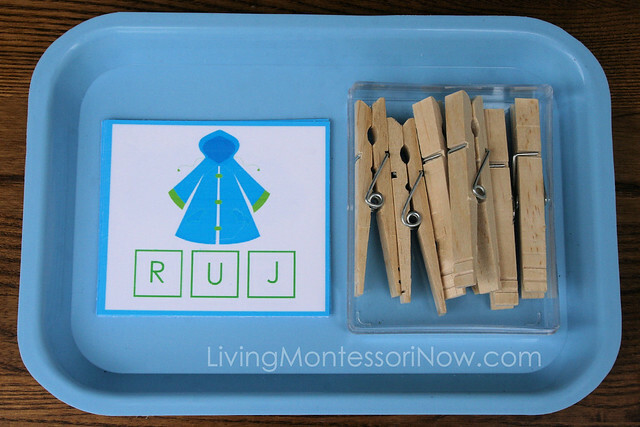 I made this into a clothespin activity like the count-and-clip cards also in the April Showers pack. I used a medium-size tray from Montessori Services, which is very handy and more difficult to find locally than larger trays. I would use a ¼” round color coding label in the color of the tray on the back of each card to correlate with the correct position of the clothespin. This serves as a control of error (instant self-correction devise). If you have a preschool or group, this would be a great activity for a large- or small-group presentation, although it can be introduced individually, of course. If you’re presenting to a large group, go to the rug container, get a rug, and roll it out on the floor in front of you. For an individual child or small group, it’s helpful to use a rug if you’re presenting an activity on the floor. Go to the shelf where the activity tray is located, pick up the tray with both hands, and carry it to your rug or to a table. For a large-group presentation in a preschool, generally the children will be seated in a circle. Present the activity facing toward the group. If you’re presenting to an individual child, have the child sit to your left if you’re right-handed so that you don’t block the child’s view with your arm. After attaching the clothespins to all the cards, I would turn the cards over to see that the color-coding dots are under the clothespins. When you’re finished with the activity, put the activity away on the shelf. Always show how to clean up and put away an activity when you first present it. If you had a rug out for the activity, roll the rug up and put it away. For this 1-5 number activity, I used two of the acrylic raindrops as game pieces, although there are paper printables included that you can use. There’s even a numbered die included, which is easy to assemble. To organize the small items in this activity, I used two Really Useful Box organizers (which I find really useful ;)) from an office supply store, although you could use any sort of small containers that work for you. I used the blue glass gems as pretend raindrops (10 gems since the numbers are from 1-10). Paper raindrops are included in the printable, although I used the glass gems because they’re 3-dimensional. 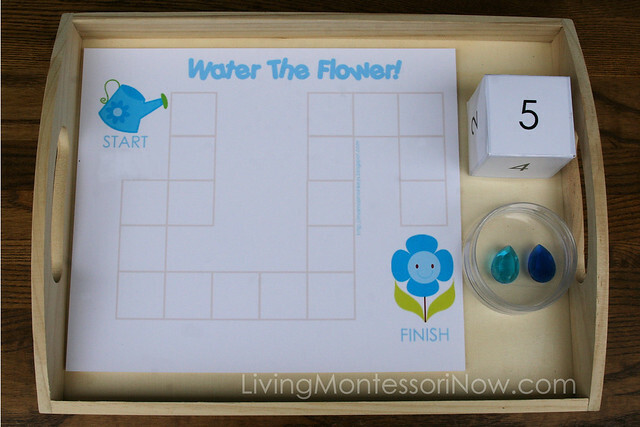 For this activity, place the number cards face down in mixed order, draw a card, place it on the green square on the mat, and count out the correct number of raindrops onto the page. For the “What Color is the Umbrella?” activity, I think it would be great to match up the umbrella cards with the tablets from Montessori Color Box 2. (Here's a post with DIY Color Tablets and presentations.) I would probably also use the umbrella cards for a color scavenger hunt where the child(ren) would find objects from the classroom or home, matching the umbrella colors. I often laminate handwriting practice cards to create wipe-off handwriting cards. I would use the cards intended for 3-part cards or memory game as a cute theme-related memory game. 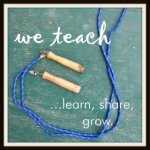 I recommend downloading some of the printables linked to in the following post to use as 3-part cards if you’re doing a spring- or gardening unit: Free Montessori Botany Materials for a Gardening Unit. Deb Chitwood is a certified Montessori teacher with a master’s degree in Early Childhood Studies. Deb taught in Montessori schools in Iowa and Arizona before becoming owner/director/teacher of her own Montessori school in South Dakota. Later, she homeschooled her two children through high school. Deb is now a Montessori writer who lives in Colorado Springs with her husband of 36 years and their cat of 11 years. She blogs at Living Montessori Now. Linked with AfterSchool Linky Party, Tuesday Tots, The Mommy Club Resources and Solutions at Milk and Cuddles and Crystal & Co., Thrifty Thursday, Fun Stuff Fridays, Living Life Intentionally Linky Party, The Weekly Kid’s Co-op, Preschool Corner, Fun Stuff Fridays, Show-and-Share Saturday, Link & Learn, and The Sunday Showcase at Mom to 2 Posh Lil Divas and Classified: Mom. Awesome activities - love how they flow together. Great post, as always, Deb. I downloaded this pack awhile back, so I'm going to pin these ideas for when I use it. Thanks! Deb - Thank you! I absolutely love these ideas. I've written a post on my blog linking my readers to your post. Hopefully you don't mind, but I used one of your pictures to link back to your post. If you would like me to remove it, I'd be glad to do so. Thanks so much, Dawn! The post you write is lovely ... I'm honored! You're welcome to use the photo in your post. I really like this! I wonder if it could be converted to a lapbook for use during a long trip, waiting rooms, etc. Very pretty presentations. Jem raindrops are a nice touch. Thanks for sharing with Afterschool! Love these ideas! We've already got the glass gems, so it should be easy for us to set up. I really like the Water the Flower game. So cute! I pinned this on Pinterest so I would remember to do these activities with my girls. love it Deb! 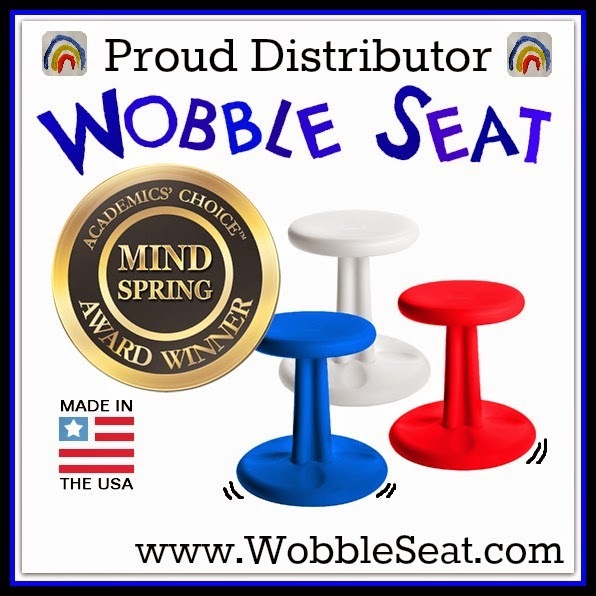 Always great stuff here - pinning it! for example "f flower" page and the others?? how can I printthese materials? These are wonderful Deb. I'll be using the water cycle activity for sure. My son asked me last week how rain is made and I didn't do that well at answering! The movement of the raindrop will be a great visual aid. These are beautiful printables and such a fun way to learn about April showers. Such a great collection of printables and Ideas. Thanks for sharing at Mom's Library this week! We are looking forward to what you have in store this week. Taking care of the earth ... today and everyday! My Two Favorite Things This Time of Year!